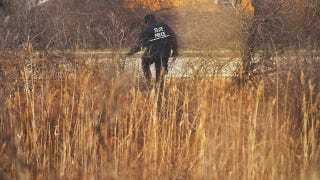 On Monday, just hours after extending the search for a possible serial killer's victims from Suffolk to Nassau County, police found a skull and a bag that contained "upper and lower extremities." The remains were found two or three miles apart, and authorities haven't determined if they come from more than one person. Bodies of four women were found in December, and another four people turned up this month. Police haven't released details on the second set of bodies, but a source tells the New York Post that one is an infant or a child, suggesting it may be unrelated to the serial killings (though still horrifying, of course). But the body count may still be growing. Another source tells the paper that the serial killer may have murdered four women in Atlantic City in 2006. Like the original Long Island victims, the women worked as prostitutes and were strangled, then dumped along stretches of highway near the water.